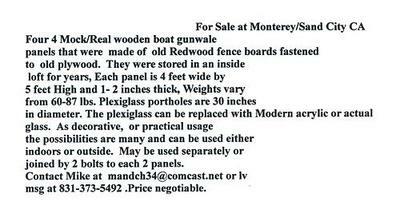 For sale at Monterey/Sand City CA 4 wood panels made of old redwood fence boards fastened to old plywood. Origin unknown, stored in a dry indoor loft for years. Each panel is 4 feet wide X 5 feet High X 1-2 inches thick, weights vary from 60 lbs to 80.2 lbs. 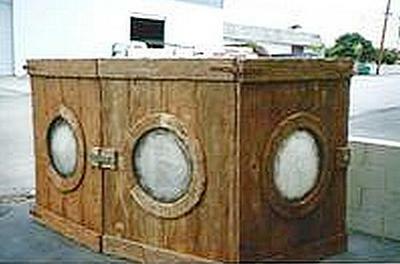 Plexiglass portholes are 30 inches in diameter. The Plexiglass can be replaced With acrylic or AS or practical usage. The possibilities are many and can be used either indoors or outside. May be used separately or together easily by 2 bolts to each two panels. Contact Mike at mandch34@comcast.net or leave msg at 831-373-5492. I'm confused as to how to send you the text changes.